People have been to the moon a few times, and, in the process, have left a bunch of stuff behind. Almost all of those items are lunar orbiters or landers, but there are also a few golf balls up there, the well-known American flag from the Apollo 11 landing, and, as previously discussed here, mirrors used for scientific purposes back here on Earth. Almost all of the items were left there with NASA’s go-head, or, at least, the organizations’ knowledge. “Almost all” because one item, pictured below, was smuggled aboard the Apollo 15 mission. 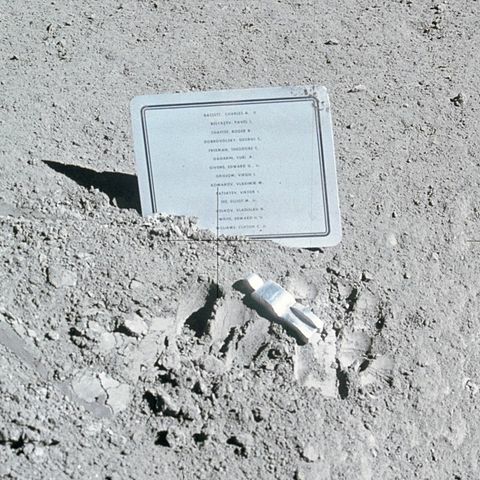 The item above, called the “Fallen Astronaut,” is a small aluminum statue (about 3″ tall) and a plaque with the names of eight American astronauts and six Soviet cosmonauts who died during the Space Race. It is regarded as “the only piece of art on the moon,” as phrased by ScienceBlogs, and was created by a Belgian artist named Paul Van Hoeydonck. [I]n addition to the physical requirements that the sculpture be both lightweight and sturdy, and that it be capable of withstanding the temperature extremes of the Moon, the statuette could not be identifiably male or female, nor of any identifiable ethnic group. Furthermore, in accordance with Scott’s wish to avoid the commercialization of space, Van Hoeydonck’s name would not be made public. Along with Jim Irwin, another of the Apollo 15 astronauts, Scott was able to bring the Fallen Astronaut on board without NASA’s knowledge. The two placed the statue on Mons Hadley, one of the moon’s highest known peaks at roughly 4.5 kilometers. (Mons Huygens, at 5.5 km, is perhaps the tallest.) Upon their return to Earth, they informed NASA of their unauthorized mini-museum, and NASA seemed undisturbed by it. (Of course, sending the astronauts back to retrieve the item was probably not a viable alternative.) NASA asked the astronauts who created the statue, so that the Administration could have a replica produced; that is how we know that Van Hoeydonck was its creator. Van Hoeydonck, now known, made another fifty or so replica statues with the intent of selling them, even going as far as to find a gallery to sell them through. After NASA got wind of the potential sale (perhaps via one of the advertisements announcing it), they asked that he refrain, and he withdrew the works from the gallery. As of 2007, again per Wikipedia, Van Hoeydonck had all but one of the replicas (other than the one given to NASA) in his possession; the one he no longer had he did not receive any payment for. As far as we know, the original Fallen Astronaut statue is still on the moon. Bonus fact: The Fallen Astronaut may not be the only piece of art on the moon after all. As reported by USA Today, it is likely that six artists, including Andy Warhol, created a tiny art gallery the size of a thumbnail, and the Apollo 12 astronauts brought it to the moon. The tiny exhibit, a replica of which can be seen at the link, is still up on the moon. From the Archives: Mirror, Mirror on the Moon: As noted above, another thing left behind. Related: “Fallen Astronauts: Heroes Who Died Reaching for the Moon” by Colin Burgess, Kate Doolan, and Bert Vis. 18 reviews, 4.9 stars, which is stunningly high.